Jemima wants desperately to hatch her own eggs. She finds a nice place to lay them in Mr. Fox's den. She almost becomes dinner, but Shep the collie saves the day. 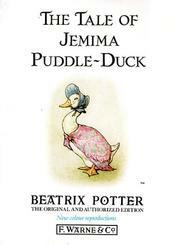 Potter, Beatrix, “The tale of jemima puddle-duck,” Children's Picture Book Database at Miami University, accessed April 23, 2019, https://dlp.lib.miamioh.edu/picturebook/items/show/10279.